I bought sausage and a can of biscuits a few weeks ago at the grocery store. Last week, I managed to open the biscuits and put them in the oven and throw chunks of misshapen sausage in a skillet to (slightly over-) cook before my husband left for work that morning. Imagine my horror when he was overjoyed about the cuisine before him. He talked about it for days. Think he is tired of scrambled eggs with toast every morning? My sister is out of school for the semester. Actually, she is out of college for good, but her graduate level classes start in January. (I want to give her credit where credit it due) More importantly, she is spoiling me by helping out with Spencer a day or so a week so that I can do a load of dishes or possibly even put up the Christmas tree. She recently informed me that Spencer could tell you what the cow says. I knew he could tell you what the dog says. He pants--I think because he can't figure out how to "bark" or "woof." It's hilarious either way. So, I asked him what the cow says, and he looked at me with his lips pushed together and said "mmmmmmmmmm." 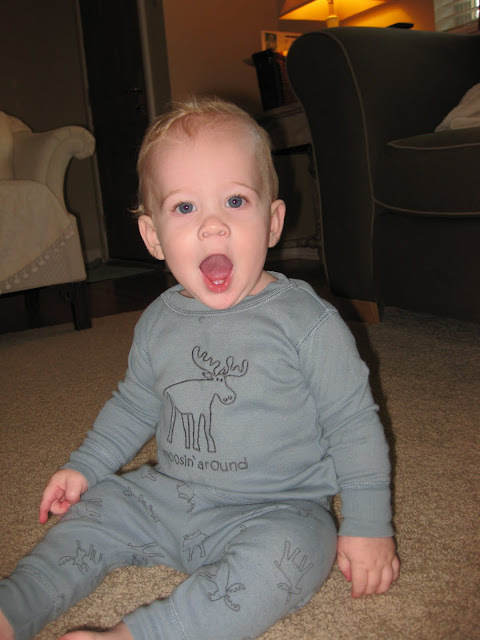 He can't "moo," but exhaustive testing has shown that he does in fact know what the cow says. This just goes to show that even though you may stay home with your child all day and (almost) every day, other people still notice things about them that you do not. I do think he was showing off for his aunt, because I am fairly certain he has never "mmmm"-ed for me. I do attempt to keep track of these sorts of things. I'm sure his future siblings will have to get an air horn to alert me to their milestones because I will be too busy making sure Spencer is not jumping off the roof or convincing one of them to do the same. Into the category of "things I swore to myself I would never do once I had a child that I now do without shame" goes letting Spencer pull everything out of my wallet...in public. The need for distraction is much greater when we are out and about! Target is the main place he enjoys a foray into "ridiculous things parents let their children do in public." I knew this was not going to end well. I pictured a credit card statement with multiple charges we would have to contest. Instead, I noticed that my visa was missing a couple of days after having used it for our co-pay at the pediatrician's office. After scouring the house, my purse, my car, and the diaper bag, I swallowed my pride and texted my husband to ask if he knew where it was. He did not. I have a feeling it is in the dump somewhere. Oftentimes, when we are wrapping up our shopping, I grab all miscellany that Spencer has pulled out of the diaper bag and cram it into one of the sacks. Then, as Spencer plays happily while I put things away at home (insert smirk here), I put things back in their rightful place. So, I think I overlooked it and tossed it out. That or someone found it and waited too long to use it. Either way, I've learned my lesson. While Spencer played with my wallet today, I paid much closer attention. Spencer's Nana turned 60 yesterday, and we surprised her at her school. I'm not sure if Spencer or Sherry had more fun. He loved the balloons we took her. He enjoyed running like a wild man through her library, and he had lunch with her in the teachers' lounge where he promptly located the youngest teacher and began to shamelessly flirt with her. He eventually lured the young (and attractive) teacher from her chair and convinced her to chase and tickle him as he wallowed all over the floor and giggled. 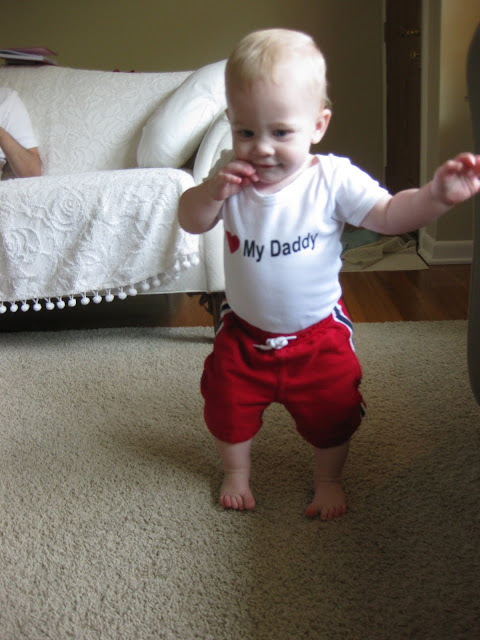 He was strutting with a little more confidence than usual because he was sporting one of his new birthday outfits. 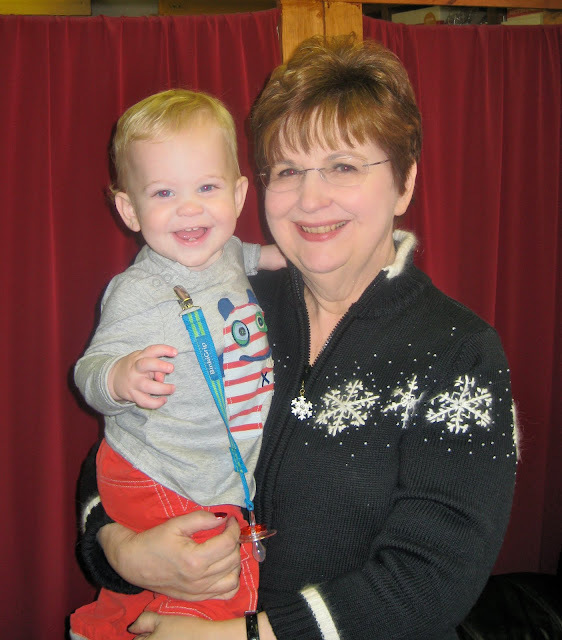 He was most certainly Nana's show and tell. I think he saw every person who is currently employed at the school. Not surprisingly, his favorite "class" was definitely the PE room. He fussed at me until I retrieved the specific color basketball he had his eye on from the huge metal bin. 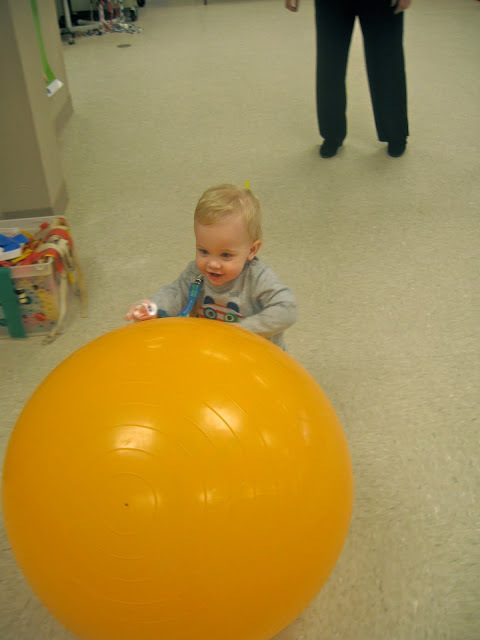 When he began gesturing towards the basketballs, I grabbed an orange one off of the top. (O, ridiculous woman that I am) He continued to gesture and then went on to "vocalize" loudly until I handed him the purple basketball that he had his eye on. What was I thinking? Thanksgiving did not turn out as I had expected it to turn out. And that's fine. Spencer did not feel well, I came down with the flu, and Jonathan had to be Mom and Dad for almost 3 days straight. I'm so blessed to have a husband who is just as attached and connected to Spencer as I am. They did great together. I think the whole thing was hardest on me. I had one plan for Thanksgiving. 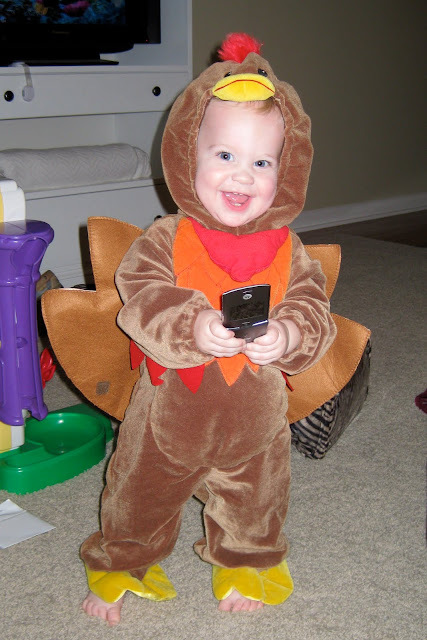 At both of our families' gatherings, I was going to change Spencer into a turkey costume that I found at Babys'rus (it was on clearance for $4.74 with tax and I just couldn't pass it up). I was then going to have him saunter out to the living room and delight everyone. I also wanted to take him to his great grandmother's assisted living home to see her and her friends. I figured they'd love it. Instead I stayed home in bed and other people attempted to dress him up for me, but he doesn't love costumes when he feels good, so, he spent a combined 4 minutes in it. Luckily for you, all of posterity, and Spencer's future wife, I took some pix at home a few weeks before Thanksgiving when I tried the costume on him for size. Little Spencer, you are 1 year old! What a joy you are to know and love. It's not just me who thinks so. You are the little boy who gets everyone's attention wherever we are, and it's usually the good kind of attention. 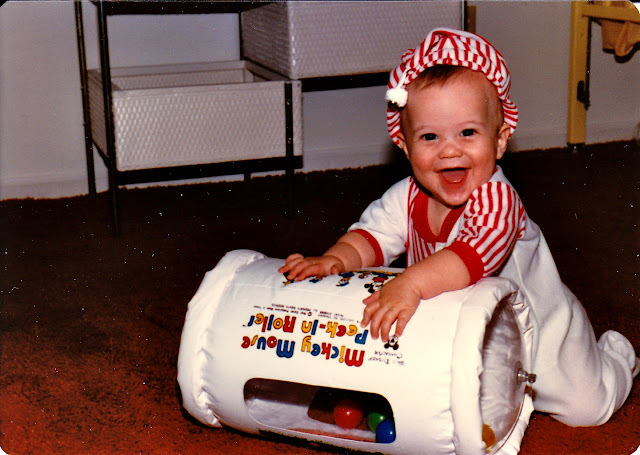 People say, "What a HAPPY baby" and "He's too pretty to be a boy" and "Is he walking? How old is he?" Some also comment on your gorgeous blue eyes and your blonde hair that is curling up in the back. But, mainly they focus on your sweet, playful smile that you flash as you wave your hand to say "hi" to all patrons of Target, Kroger, or wherever else we happen to be that day. You certainly are a people person. You are adored both publicly and privately and have come to expect it as the usual course of things. Your Gigi insists that you can always teach other things like humility and delayed gratification when you are older but that if you miss instilling the knowledge that you have power to manipulate the world around you and that people like and love you, it's very hard to put that in later. As in most things, I think she is right. And you have definitely internalized these life principles. You love to rough house, run, be tickled, jump onto soft things, and dance to music. You have finally decided to pay attention to steps instead of just walking on like they are of no consequence to you. You now slow down and hold on to something to go up or down a step. Well, sometimes. A few days ago you finally got your foot up onto your "toy table." You had been getting your knee up for quite some time, but you really needed a foothold to be able to stand on it. Mission accomplished. You are really into pushing buttons right now. It appears to be the thrill of cause and effect (and it usually involves music). You want to be in on whatever I am doing. You FINALLY enjoy your baths. You dump cup after cup of water on your head and then get a huge smile on your face. You seem to be concentrating on some fine motor skills lately (you certainly have the gross motor stuff down for now). You can take the credit cards out of all the different slots in my wallet, and you can take the battery panel off of the remote control. You were sick a couple of weeks ago, and you learned how to stand there and stick out your nose when I say, "Let me wipe your nose." You also sit down immediately when I say it if you think we are getting you ready to go somewhere. So, now you have given yourself away. You automatically run the other way when I say I am going to change your diaper. Your seemingly new sleep schedule involves waking up between 3 am and 5 am screaming. Your dad gives you a bottle and then, instead of being up and at 'em, you go back to sleep. Then you sleep until 6 or 7 and sometimes later! Then, naps seem to be of no importance to you. You refuse them at the old, regular times and you refuse them at later, adjusted times and by the end of the day you are exhausted. You run into everything with your head, you fall, etc. I'm working on getting a new groove, but we've hosted many a virus in our house this past month and we are all worn out. You are such a precious baby boy. "Portrait of the Spencer as a Young Man"
Spencer is almost 1. Part of me CANNOT believe he is that old, and part of me feels like he has always been in our lives. I still get overwhelmed with gratitude for God's gift in him. On the less mushy side, he is HILARIOUS and never boring. And I really appreciate that. I bore easily, so thank goodness he's a mover and a shaker. I may sound like I'm complaining about his activity level and quirkiness sometimes, but just know that I'd be bored out of my mind if he was what is traditionally referred to as an "easy" baby. 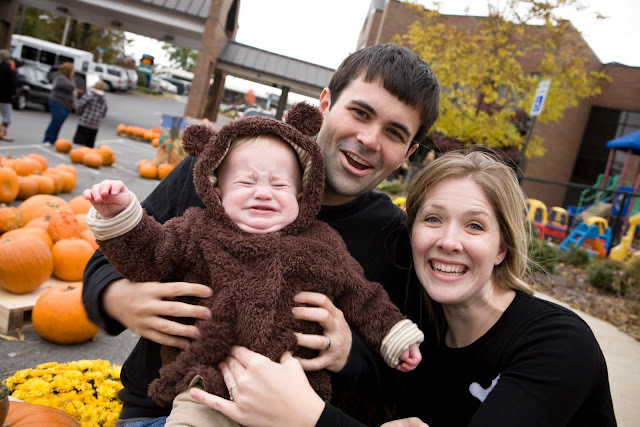 For example, when we scheduled a photo shoot for this fall, I thought, "Why not get a 'family picture'?" After all, what kind of mother would I be to not have pictures of myself with my husband and my child all fully clothed and smiling. It's almost like you attempt to do it, just to prove to yourself that while it doesn't happen very often, it's not because you CAN'T do it--you just don't bother yourself with silly things like putting on eye liner or pulling together multiple pieces of clothing that fit you properly to make an "outfit." 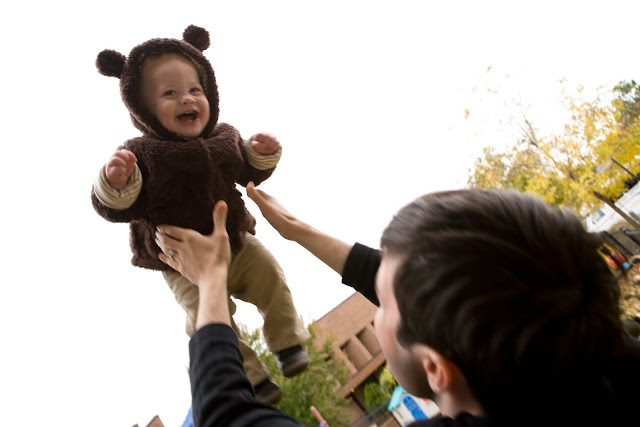 The last time I attempted this, Spencer was 6 weeks old, and it was a challenge then. But that photo shoot had nothing on this one. Now, you have to know that we have some beautiful pictures from this shoot. Really. He loves our photographer (and friend) Hannah. He flashes his flirty little grin at her big beautiful brown eyes. He ain't no fool. He just wasn't up for being in a sitting position because that necessitates that his body remain stationary for more that 1/10 of a second. That's just not his thing. "What IS his thing?" you ask. Well, he prefers to stand in any shopping cart with or without a buckle, to carry 3 heavy things while walking, and to refuse milk for an hour and then eat an entire grilled cheese sandwich. Almost a year ago, I was in the hospital having Spencer. My OB commented that Spencer was going to have his own perspective on life. He said this because Spencer WOULD NOT turn over the way babies typically do in order to put an end to the "delivery" process. They are supposed to rotate to a face down position. Spencer refused for a good 2 hours, at which point we reached a compromise of a "sideways" delivery. I didn't think much of it at the time. There was much more to think about, like trying to have a baby in between yanking my oxygen mask off to throw up...but I digress. "He told you I have a mind of my own, Mom! How long until you cease to be surprised?" I read that Spencer should be pointing to things now, and I was trying to remember if he's ever technically pointed at anything. Then it dawned on me, he takes my hand and walks me to whatever he wants. Why would he point? When I keep my hands out of his reach because I don't want to face the temper tantrum that will ensue when I don't stand up and walk when he pulls my hand, he grabs my big toe and starts pulling it as he walks. And it's not just me. He will take anyone's hand who will give it to him. He will then walk them to what he is currently interested in and try to convince them to do his bidding. Did I mention he's a little bit of a thrill seeker? He loves the grass in the backyard, because he figured out 1--that it slopes in certain places and you can get running PRETTY fast and 2--that when you get running pretty fast and then squeal with excitement you inevitably fall, but that's ok, because it doesn't hurt to fall in the grass. I am usually the one taking pictures of Spencer, so there are not a lot of the both of us. And typically that's a good thing because, as I mentioned above, I don't consistently present as "photo ready," at least by 21st Century American standards. So, I really like this picture that Hannah took, because more than most it typifies what life with Spencer is like right now. Boisterous, strength-requiring, joyful, but purposeful in our intention to love him and teach him the best we can so that he can be and do what we cannot imagine. Where's the best (or worst) place you've ever found a paci? Alternate title: "Necessary Evil." I think it's because you HAVE to go, but I hate grocery shopping. And I think Spencer knows. He decided that since he loves me so much, he will make it impossible for us to go grocery shopping together, thereby exempting me from my chore. Unfortunately, he doesn't understand that although his father happily gets up with him in the middle of the night, cooks many-a-night, does as many (or more?) household chores as I do, maintains both cars, pays the bills, works full-time and teaches a college class on the side, he does not have much extra time. He does go by the grocery store sometimes, actually. At this point, sane people are asking, "What the heck do YOU do all day?" To which I reply, "I keep Spencer from killing himself." Yes, that pretty much requires all the energy I have most days (it seems). But I do toy with the idea of mastering a few more tasks WHILE taking care of Spencer. For example, last week we went to the grocery store. We got through the produce with lots of waving to strangers, smiling, and gerber yogurt snacks. Then, we made it to the bread section where he insisted on chewing on the bag of bread that he managed to get out of the basket WHILE he was strapped in the front part of the basket. For about 1 second I thought about letting him chew on it, then reminded myself that we've come too far to lose a child to a plastic-suffocation event. So, I took it away. Cue the screaming. Yes, I gave him something else to chew on. I think it was a box of cereal bars. My kid is not stupid (aka: easily distracted). More screaming. We made it to aisle 3, or "lots of canned tomato products that should all be called the same thing aisle." I had about 4 recipes I was shopping for, each requiring what seemed like 6 different tomato products apiece. When Spencer realizes that I won't be letting him take things off the shelves, he decides it's time to get down. 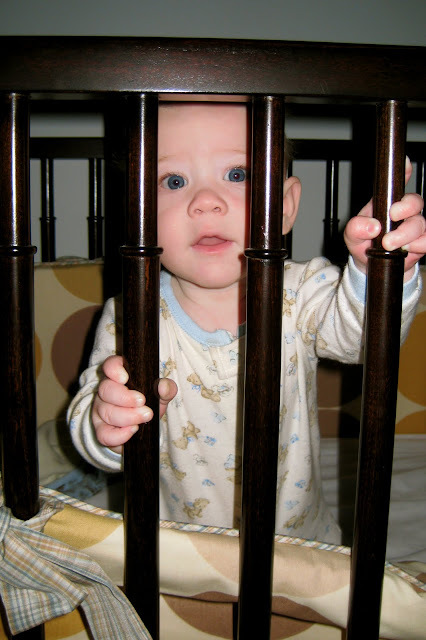 And, I don't know if this will make sense until you've held Spencer, but if he decides he's going to get down--I won't say that you can't keep him from it, because that's not true. What I will say is that keeping him from getting down is the only thing you can do. You cannot both keep him from getting down and continue to do anything else. Or think of anything else. At least I can't. Anyone who thinks they can is MORE than welcome to take my baby and my shopping list and give it a try. I'll give you $10. At this point, I give up. I know that "real" moms pull themselves up by their boot straps and go on. But I call my husband. It doesn't help that I know that he's 1 block away, and that today he has a fairly flexible schedule. Not to say he isn't working hard--he is. But his job most of the day is to get his job done. And that can be done at all different times of the day--lucky for me. So, he comes to get Spencer and I finish shopping. It probably took me another 45 minutes. And this is why, I tell myself, I did not marry a doctor. I need a husband. I have lots of needs. I'm needy. And I'm cool with that. My dad's a doctor. I love him, and he was always there for me. But I was his daughter, not his wife. My dad was not there to come hold me while my mom finished grocery shopping. I'm not saying he should have been, I'm just saying God knew what he was doing when he gave me Jonathan. Aaaaall that to say I tried a different grocery store approach today. Instead of taking Spencer when he was chipper, I took him to the playground first and tried to wear him out. I thought the "well-napped" approach was wise, but it was not for us. So, today I dragged my exhausted 10 month old to the grocery store. The same one, since I wanted my experiment to have as few variables as possible. I put him in a back-pack carrier this time, since I knew better than to ever try to get him to sit in a cart without standing up. (Yeah, we had a few Target outings in between these two outings to firm up my opinion on this). Also, I took him when I knew Jonathan had a staff meeting, so there was no way I was calling my husband to bail me out. It was do or die (or leave a full cart). We made it through. I bought MUCH less. I bounced him the whole time. And he did fuss quite a bit. But I felt like such a success until--alas! He fell asleep in the car on the way home. First of all, he NEVER does that. Secondly, when he does, no matter how short the period is that he is asleep, that sleep he does get is a substitute for whatever nap he was about to take. So, he took no afternoon nap. O, don't get me wrong. I always try anyway. We "tried" for about 45 minutes. No dice. Made it to the store. Made it out with food. Stuck with a 10 month old who'd had about 1 hour of sleep all day. Obviously he's asleep now. AND I just this second hung up the phone with my husband for whom I tell myself it is worth going through all this madness because he will so appreciate having dinner available to him when he gets home late from work these next couple of days. He told me he was on his way home, and I reported to him the food that was here. That report was followed by the comment that he'd had pizza at work, so he wouldn't need any dinner tonight. I should hang a sign on our door: Comedy of the Absurd playing daily. We went to Louisiana this weekend to visit some of my family. One of my cousins is a high school senior, and he has accepted a football scholarship to Tulane. We are all so proud of his hard work, and we went to see him play Friday night. Against all common sense, I took Spencer who had missed his afternoon nap. My kid goes to bed at 7 WITH an afternoon nap. The alternative was to leave him with a babysitter he didn't know in a house he'd been in for about an hour. This seemed cruel to both the sitter and Spencer. I knew we could leave the game if needed--so on we went. I danced him around to the pre-game music, and he loved that. Then everyone yelled and screamed as the players ran out onto the field (me included). He did NOT love that. After a few more outbursts from the crowd (all of which he handled poorly), he nuzzled his little head down and fell asleep. This, after I just went on and on to my aunt about how my child NEVER falls asleep in public. Ha! Apparently I just never let him get good and miserably tired. (Actually, I typically safeguard against this on purpose) I have a feeling some of the aversion to the noisy crowd was due to his insane level of exhaustion. However, he's never been a big fan of loud people. (Yes, ironically, he has me for a mother). He slept until the end of the half when there was another very loud moment. Then, it was time to go back to the hotel. Of course, he wouldn't fall asleep for hours since the nap at the ball game had taken the edge off his sleepiness. It made for an interesting night. I can't believe you were holding out on me mom. Betrayal. I'm going to chew on this leaf indefinitely just to prove my point. 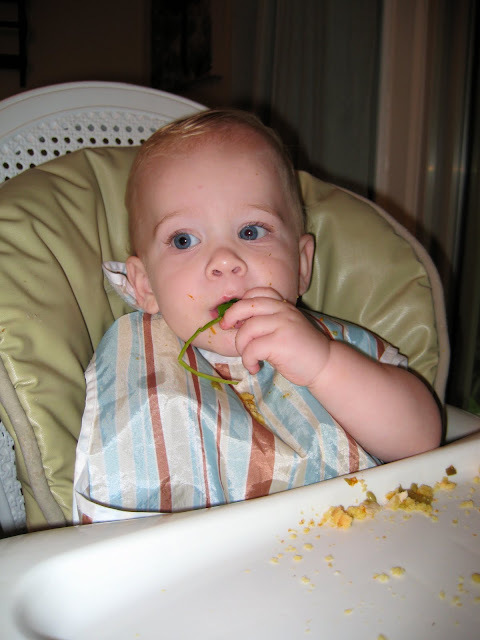 I'm going to show him these pictures when he is 3 and refuses to eat spinach. 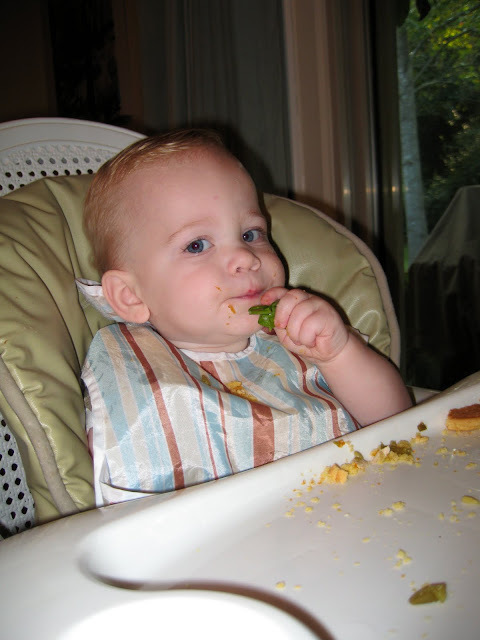 And again, when he's 12 and refuses to eat spinach. He had never sat in his seat this long, and he has yet to do it again. I guess it's time to pull out the mixed greens. Day and night protection in one convenient box! Each pack includes the right mix of Happy Days and Happy Nights Diapers for 24-hour protection. Happy Savings coupon booklet included in each pack featuring up to $10 in savings when you buy Fisher-Price diapers, toys and baby gear. I have a 9 month old baby boy who sleeps on his tummy, so night time diapers are a must for us. I was so excited when I saw these online and read all the great reviews. Lately, we have struggled with dirty diapers leaking and have not had problems with wet leaks--until we used this diaper. The first morning, my baby woke up SOAKED. This hasn't happened in months, and he'd had no more liquids than any other day. I am very disappointed. I think I've discovered what Spencer wants for Christmas. It was love at first sight. When I took him out he threw a temper tantrum. I didn't get any pictures of that, but it was impressive. He LOVED the horn, but was very perturbed that he couldn't honk it. He fussed until I did it over and over and over and over and over...you get the idea. Later he realized that the wheels on one of the cars had rain water in it. And he could drink it AND splash it every where. That's when the real fun began. He pulled the whole car over on himself twice and didn't make one peep about it. He just sat/laid there until I lifted the car off of him. 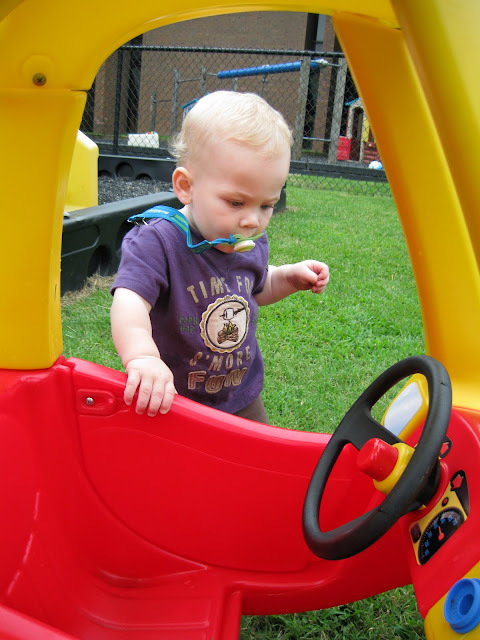 He also noticed that when he twirled one of the back wheels, the other one went around too. He kept trying to touch them both at the same time. Such a deliberate little child. 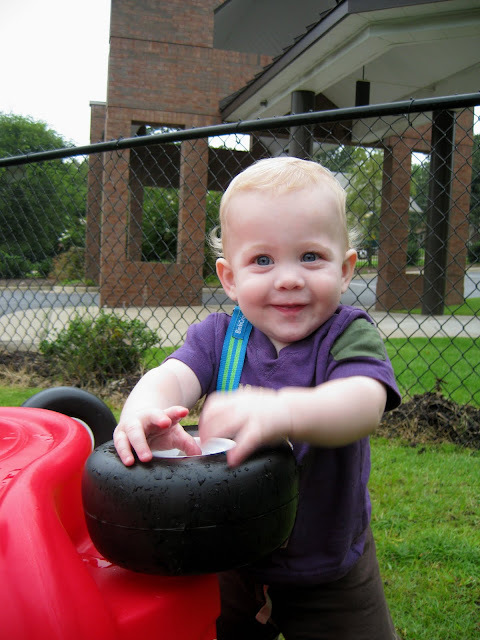 Observing him playing with this car would have been a developmental specialists dream. His wheels were turning! Excuse the pun. I've always loved this company and hoped I'd be able to dress my little one in their clothes one day. 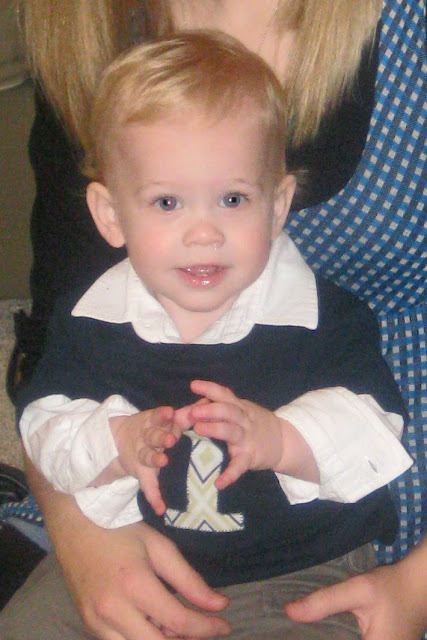 They are not cheap, but I have a mother-in-law who LOVES to outfit her little ones. We have ordered some winter clothes from them, and I can't wait to see if it's as cute in person as it is online. They are offering free shipping (and free shipping on returns?) to first-time customers through the end of September. I wish someone had told me about this web site sooner! I LOVE all it's basics, and would have had Spencer in this stuff everyday when he was a newborn. How great for days you want to take pictures! I hate it when clothes distract from a baby's face! Also, what a perfect "go to" for costume building blocks! A boutique in our area carries this line, and at the end of the season they mark it WAY down! I have been very happy with how it's made, etc, but more importantly it looks very "boy"--which I love! I have not ordered anything from here yet, but they have some cute things. It is the same company as Gymboree. I think it is supposed to be like Old Navy to their Gap. Let me know if you've ordered any of their things. I hate paying shipping, so they'll have to have something REALLY cute before I bite the bullet. 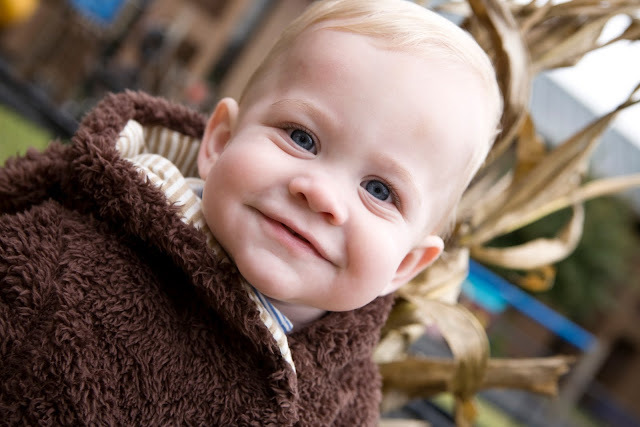 Favorite Baby/Kid Clothing Brands? Anyone? Aloha! Spencer seems more like a toddler every day. Even his screaming is more grown up. Yes, it's louder, but it is also filled with big boy emotion. He has 2 bottom teeth now, and 2 top ones are well on their way. We are praying that's why he continues to wake up between 3 and 4 am these days. We survived the stomach virus the week leading up to Labor Day. I consider it a moral as well as a physical victory. Spencer had his 9 month well visit last week. The nurse who gave him his flu shot said, "Wow! He is A LOT stronger than he looks!" This, coming from a woman who does this all day, every day. I just laughed and agreed. 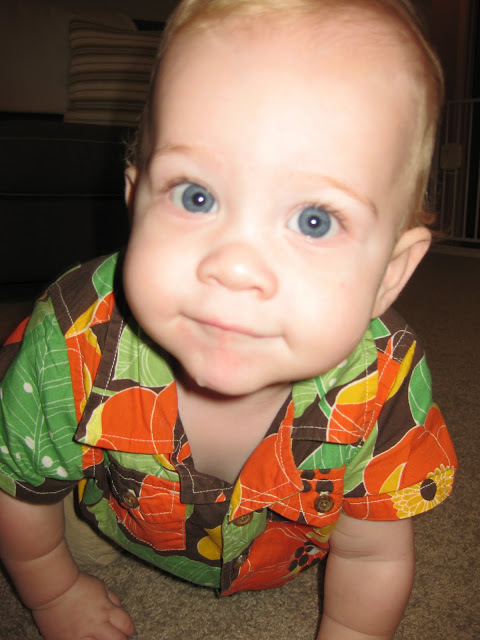 Someday Spencer will be so proud to hear what a strong baby boy he was. He is in the 25-50% percentile range for weight, and BARELY in that range for height. I had been wondering why they made baby shorts so long. 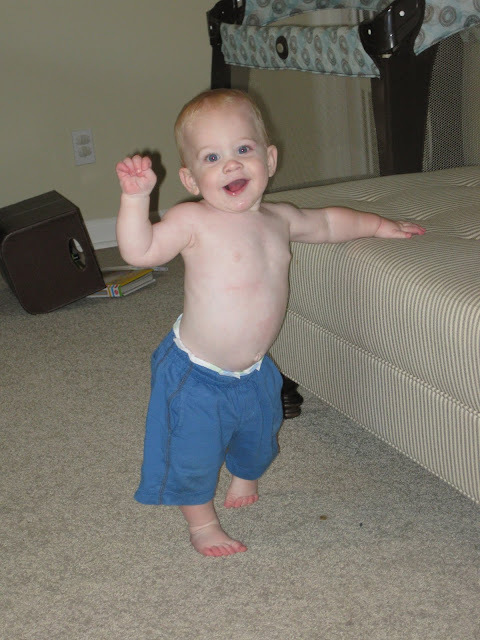 All of his 3-6 month shorts still fit him like capris! He has been shutting himself into the dark bathroom lately. He doesn't scream or cry or yell. He just starts talking to himself (or me?) about it. Then I have to slowly crack the door open and coax him to step back further and further so as to not knock him over. Eventually we get a big enough crack for him to walk through. It is raining this morning, and Spencer crawled over to the sliding glass door, laid down on his tummy and stared out at the rain. It was pretty adorable. He ate a whole waffle for breakfast yesterday. It was quite incredible. Then, last night he enjoyed my stuffed mushroom. I didn't have one bite. The kid will not eat a bite of banana, but stuffed mushrooms? bring 'em on! We went to see Jonathan's grandmother in the nursing home yesterday, and Spencer LOVED checking out the wheels on everyone's walkers and wheel chairs. He was obsessed with them. I tried not to think about all the germs on the FLOOR of the nursing home. We are certainly building his immune system. I have sensitive skin. And that may be the biggest understatement you hear all day. For example, I had swollen eyes and a rash around one eye for about 3 days after wearing brand new, expensive "hypo-allergenic" eye shadow for some family pictures. (So, if you see me out and about with no makeup on and think, "Why doesn't she ever 'help' herself?" Now you know, most makeup DESTROYS my face). As you can imagine, when I find a product that works for me, I stick with it. For years I used a lotion eye makeup remover by Nivea. I can't use any of their other products, but this one worked for me. They have apparently stopped making it. (collective sigh) I was going to bite the bullet and buy Clinique's lotion eye make up remover, but the sales lady told me the wrong price then rung me up for the correct (and higher) price. Of course, that, in and of itself would not keep me from buying it--people make mistakes. However, when I asked her about it, she was very rude and acted like I was an idiot. Always appreciated by an exhausted mom who dragged her infant to the STUPID mall. So, I walked. I'll just use water before I buy that from them now, I thought. And use water I did, until the latest crazy rash, when I really needed something gentle to help me get off all of the expensive and angst-causing gook we call "make-up." I went out on a really long limb and bought something that I have never used before and could not try beforehand. I know that you can go to nice stores, and pay more than we spend on groceries in a month to walk out with an excellent product. Can you tell from the tone of this paragraph that I am not only too thrifty for that but that I am morally opposed? Physician's Formula Lotion Eye Makeup Remover. It is great. And coming from me, that is all you need to hear. If the oily stuff doesn't bother you, that's fine--but as you can guess, it burns my face. And THIS is the answer. Things seldom have this sort of happy ending for me in the "product" world, so I felt compelled to share the good news. Please let me know if you have a favorite (and very affordable) product! As many of you know, we have only temporarily connected to the internet here at the Kelley Household. Partly for financial reasons, but even more because I have little to no self-discipline. My parents have moved into their new house, and they will be hooking up their internet on Thursday. We were "storing" it for them. There is something too satisfying to the ego to have a list of "followers." For that and random other non-reasons I will continue to post periodically as Spencer allows. Now I have to brag on my husband for a paragraph. (I owe it to him after posting baby pictures of him in his "Christmas outfit") He currently works 2 jobs, gets up with Spencer in the middle of the night, spends entire weekend doing yard work and cleaning house with me, does the dishes every day, and of late, sent me to get an hour-long massage and a pedicure on his day off. Additionally, he puts up with me--which, as some of you know is not really an art or a science. It's really more of a spiritual discipline. He likes me even when I really don't like myself. You do not know patience until you have known Jonathan. God gives good gifts. Pronunciation: \ˌmō-dəs-ˌä-pə-ˈran-dē, -ˌdī\ Function: noun. Etymology: New Latin. Date: 1654. As of now, there is no criminal activity to report. 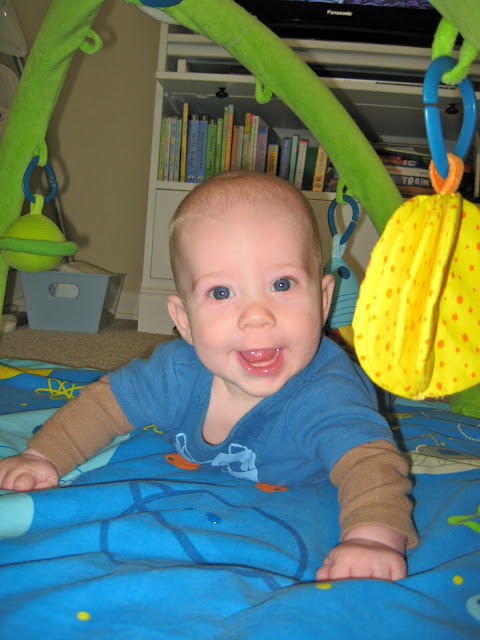 Just this fun overview of Spencer's gross motor accomplishments. 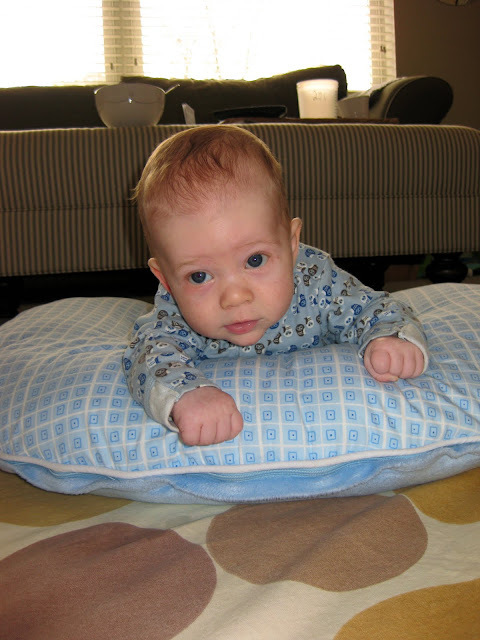 2 months: I would type, "holding his head up," but he did this from day 1. Honestly. 5 months: Trying to figure it out, and doing a little core strengthening. 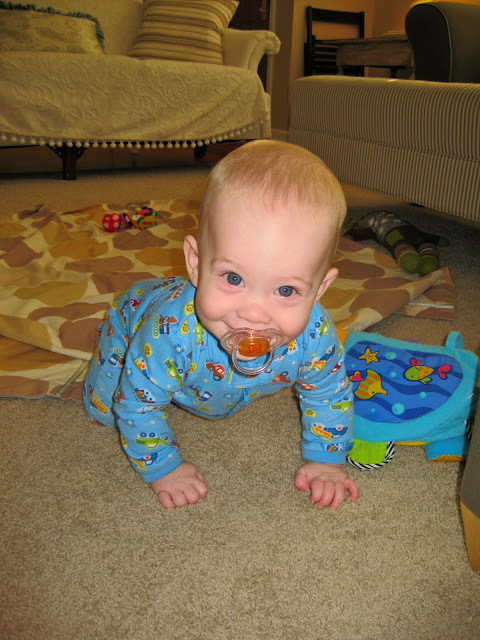 6 months: Crawling! Ah, the way life should be! 6 months: "Who doesn't crawl and pull up in the same month?" Still 6 months: "I think I'll pull up everywhere." 8 months: He never was a big fan of sitting. 8 months: "I'll just play on my knees instead." 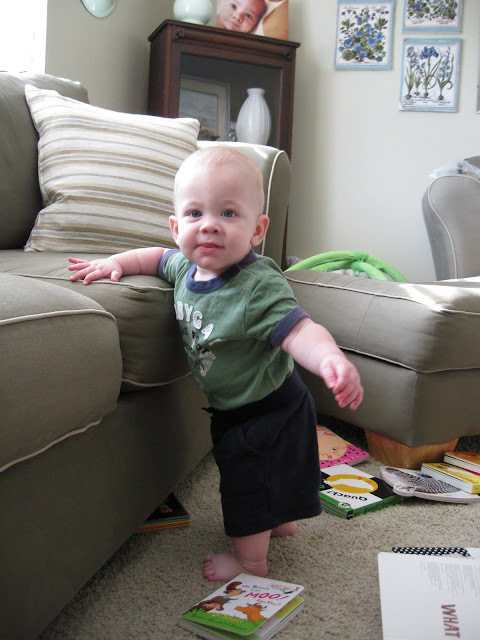 8 months: Continually trying to walk. Here is his "1 hand" maneuver. He's been taking steps unassisted for a month now, but I've yet to get a picture. Don't worry, I have witnesses. Obviously, this post could also be entitled, "Because It's Fun to Brag." I have decided there is no shame in this. I threw up for 6 months, and I'll brag obnoxiously as I feel the need. 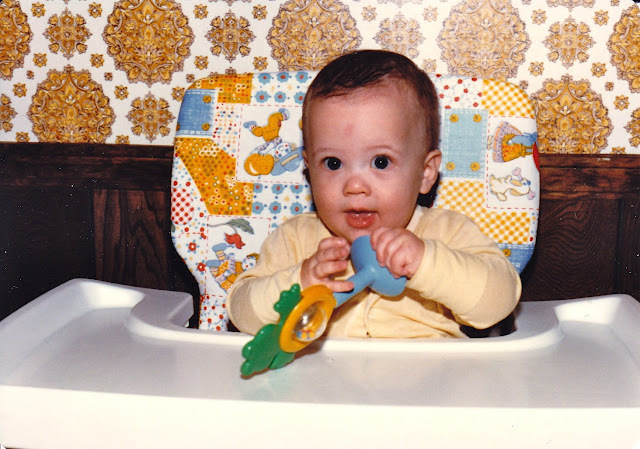 This is Jonathan at 6.5 months. This is Spencer at 7 months. I showed the title to Jonathan, looking for approval and affirmation. He just read the description with a smirk. I ask, "What? is it not funny? Does it not make sense? Do you not like it? What?" He paused, looked at me, and said, "No, it's funny. It's just you, that's all." And he walked off. I decided that was all I could hope for from me, was "just me." So, here I am. Look forward to deep, hard-hitting posts, like "Why Stain Removers Don't Remove Stains" and "Why Spencer Likes the Round Teethers the Best" I know you're' excited.